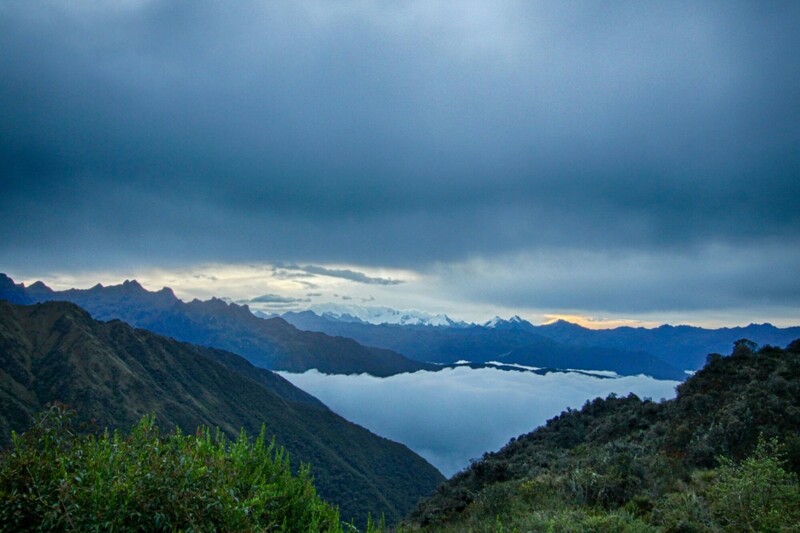 If I had written about the Inca Trail on the first day of the trip, the mood would have been low and the tone negative. That I didn’t write a word, in itself, says a lot. I was tired; not sleepy, body sore tired. My lungs hurt and my knees, ankles and back ached. The hours of up hill hiking pushed my poor unfit body to the limit, and always in the back of my mind was, “tomorrow is supposed to be the hard day”. 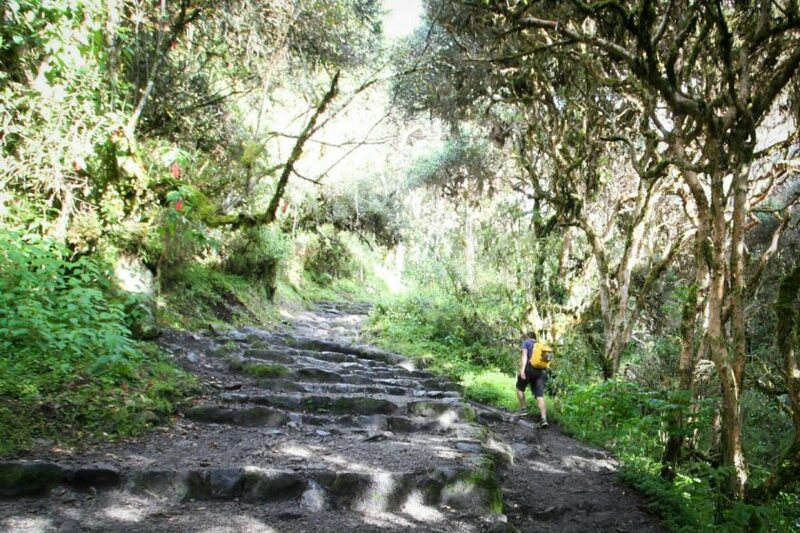 From the time our guide mentioned that the trail we were following was a path of religious pilgrimage for the Inca, all I could think was ‘what the hell am I doing this for?’ I wouldn’t do the hajj to Mecca, I wouldn’t do a pilgrimage to Bethlehem; it’s not my faith. 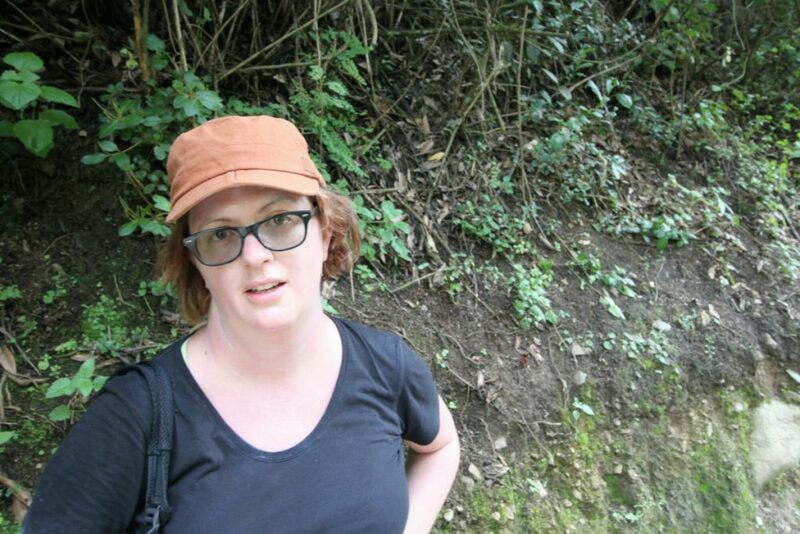 Why am I doing a pilgrimage for a long dead religion? Moreso, why the hell am I walking such a great distance to reach a place that has a train line? As I sit here in my porter-carried tent, on day three of a four day trek to Machu Picchu, I can hear the train puffing its way through the valley below. I crossed that track within 5 minutes of starting my journey on foot. Since then I have walked over two mountain peaks, while the train follows the river at the bottom. I’ve almost finished a four day hike at altitude. Do I feel a sense of accomplishment? No, not really. I do, however, feel a strong sense of appreciation. The porters stay back to pack up after us, and run past me with huge and heavy packs, as I struggle up a hill. Then, they cheer for me as I arrive to the newly constructed camp in the afternoon, like it’s a huge accomplishment. Watch your step, not the view. Also, by just catching the train I would have missed the scale of it all. 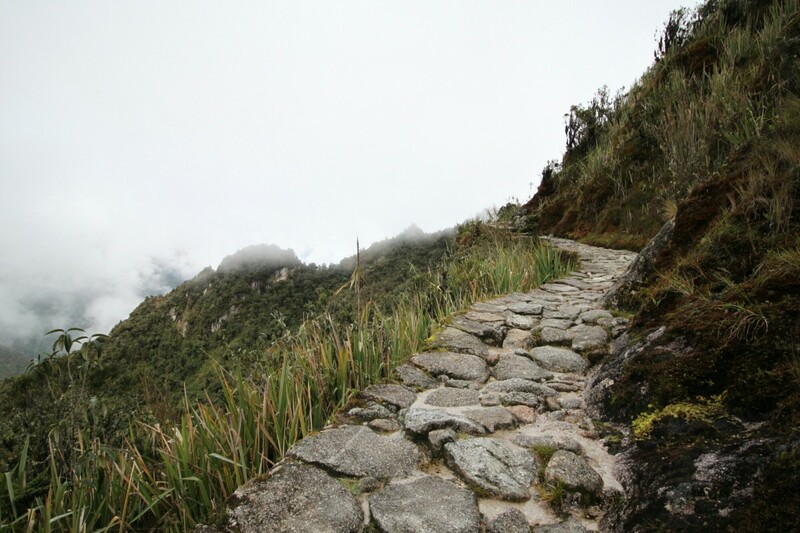 Every single metre of the path was carved out of sheer cliff by the Incas using only hand tools. Every step I trudged up and every rock I tripped over, was cut and placed there over 500 years ago. Even back then there was a faster commercial route, which follows the river. They built this trail to walk amongst their gods, the mountains and to be closer to nature and the sun. That I can appreciate. Basically, the views are spectacular. On the trek we passed through various microclimates, each with its own distinct flora. We sat in jungle-like weather surrounded by furns and moss, while looking at snow topped peaks. In a rain storm, we waded through newly formed creeks and waterfalls. 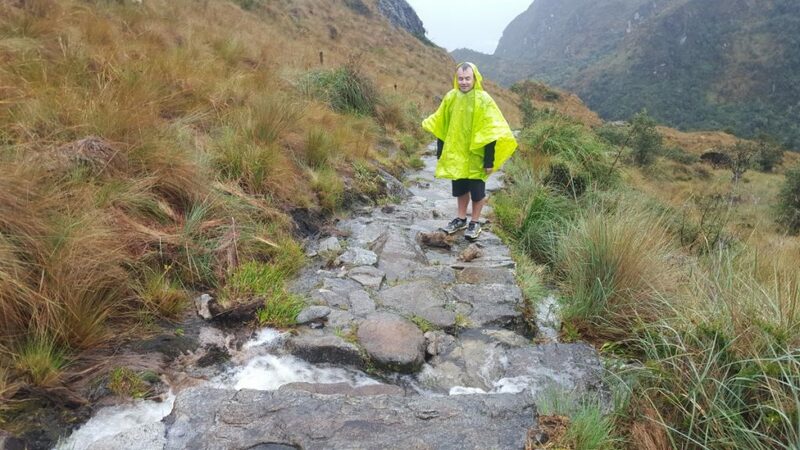 Inca Trail in heavy rain is fun! 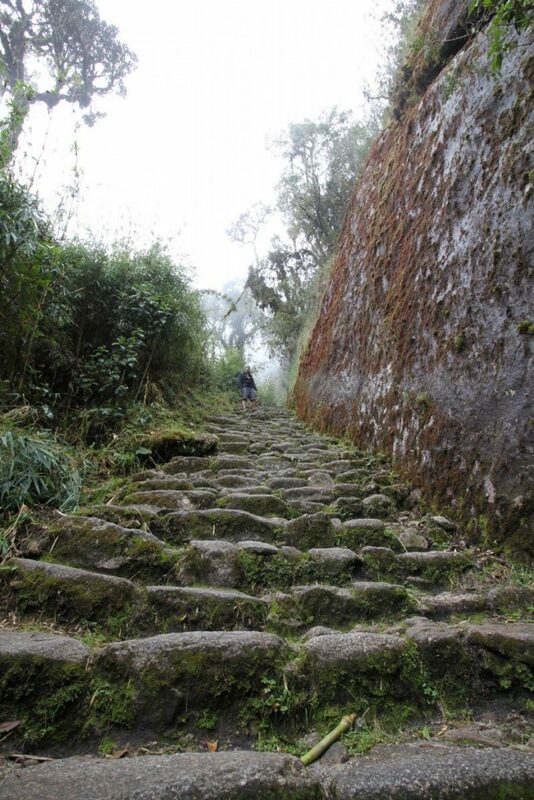 We passed terraced farms built by the Inca, military fortresses and celestial observatories. 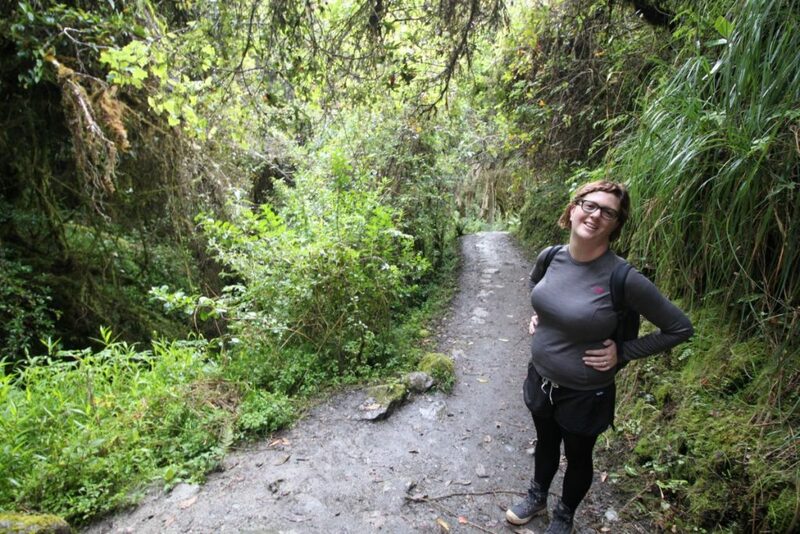 And then reached the ruined town of Machu Picchu. The walk is worth it. And surprisingly, I felt quite good and fit afterwards. I just wish that I hadn’t spent so much of the trek promising myself ‘never again’.